Imagine being a student of World War II history and a fan of films about that tumultuous time. Perhaps movies like Midway, Tora! Tora! Tora!, and Patton are among your favorites. You’ve been watching films like these for decades. You’ve studied the battles. You know the players. You understand the weapons and tactics. You get it. The same way some people know baseball statistics, you know all about WWII. And, while some films are inconsistent in their execution—and even get a few details wrong—you know a great war film when you see one. While you revisit the classics from time to time, you also wait for each new World War II film with anticipation, hoping it will capture that history in stunning and accurate detail. You are totally open to stories like Dunkirk that use modern filmmaking and editing to tell historical tales in new ways. But, no matter what, you still want your WWII films to make sense. Now, imagine that a group of upstart modern producers are given tens of millions of dollars to create a “fresh” take on World War II for modern audiences. Instead of experts in military history, they bring in writers who normally create romantic comedies and police dramas to serve as the writing staff. They hire a production designer who typically creates children’s TV shows and sitcoms. 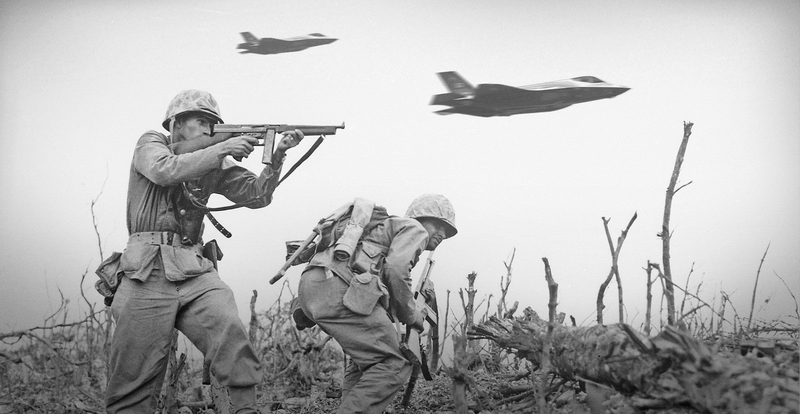 WWII Redux! 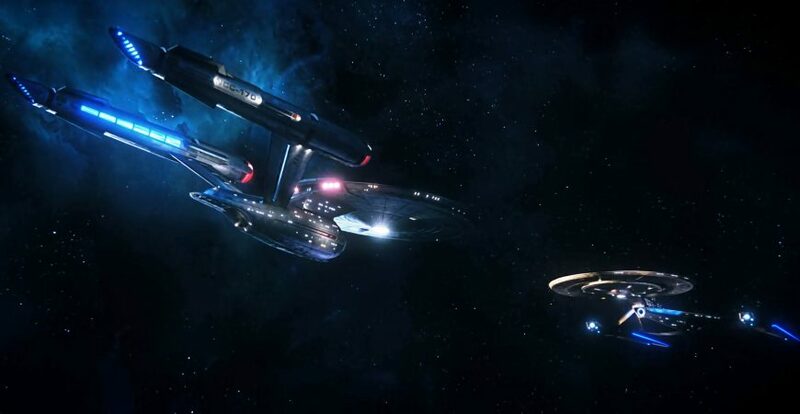 This is what Discovery looks and feels like to old-school fans like myself. 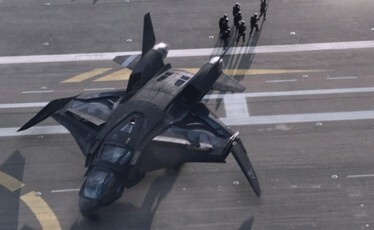 Instead of P-51s and Corsairs, the design team decides to use modern fighter jets like F-35s because the audience will “relate to them better” than propeller-driven planes. They add yet-to-be-invented helicopters because “they look super cool”. They recast real historical figures in edgy and challenging ways—Winston Churchill is now a bodybuilding 25-year-old strategic genius who has a thing for hot women and hamburgers; and Adolf Hitler becomes a cross-dressing sailor with an appetite for makeup and political power. Key circumstances of the WWII timeline are re-ordered or left out completely. Why? Because who cares about history when you’ve got a fun new story to tell? As a World War II buff, how would you feel as people begin to embrace this new vision? That a huge number of folks actually liked it better. You’d end up being shocked, sad, and dismayed. Something you’ve cared about and understood for so many years has become bastardized and destroyed. And yet, millions openly embrace it. When you try to have a civil discussion regarding your misgivings about the new WWII series, you are told that you’re a closed-minded, old person yelling at the whippersnappers to get off your lawn. Unfortunately, this is how many long-term fans of Star Trek feel about the series Discovery. Yes, I know many fanboy eyes are currently rolling and accusations of “butthurt” (whatever that means?) are about to be slung in my direction. But, before you jump to conclusions, I implore you to hear me out. I am not here to dissuade anyone of their love of Discovery. But I at least want to explain why I, and folks like me, don’t care for it. Regardless of what anyone wants to say about tolerance or Vulcan IDIC (Infinite Diversity in Infinite Combinations), I just don’t find this new series to be Star Trek at its core. And I’m not sure I ever will. It has to do with the overall approach: the show’s DNA. 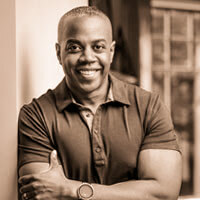 It just isn’t connected to the lineage I came to know, love, and follow for decades. The original bridge of the Starship Enterprise from the pilot episode, “The Cage”. No one has tried to truly update it. I’ll admit that I’m an old-school Star Trek aficionado. I have been for as long as I can remember. I first saw the show in afternoon reruns as a small child. I think I was about four years old at the time. I would watch it virtually every day, and even memorized the episode order so I could catch my favorite episodes each time they would play. After Gerry Anderson’s amazing UFO (which I still love to this day) and the campy Lost in Space, Star Trek was the third science–fiction series I had ever seen. I was blown away by the production design, costumes, special effects, and most of all the Enterprise! Star Trek pointed the way to an amazing future that seemed just around the corner. As I simultaneously witnessed the Apollo launches to the Moon, the show seemed to connect to a world that was growing and evolving right before my eyes. If astronauts could bounce around on the lunar surface in 1972, then what was to prevent us from eventually zipping through the galaxy at warp speed on a starship in the 23rd Century? One of my most fond early memories is of building models of the Enterprise and the Galileo shuttlecraft with my father. I also remember my mother sewing me a “Captain Kirk outfit” for a costume day at school. My close friends and I would play Star Trek on the playground and come up with our own lofty adventures. It’s something that many of them remember and still discuss to this day. My love affair with Star Trek was never about some geeky fantasy distraction. It was built on hope and aspirations. The original series showcased a dream of a better tomorrow where a diverse group of smart people got together and finally figured things out. Star Trek exemplified a future where folks from all around the world put aside their differences and—through knowledge and exploration—made the world a better place for everyone regardless of gender or ethnicity. Growing up as one of few kids of color I’m my suburban Phoenix elementary school, I faced a fair amount of racial conflict on a daily basis. Star Trek gave me hope that the problems I was facing would someday be resolved—among humans anyway. I wasn’t the only one who saw it this way. A few years ago, I learned that Dr. Martin Luther King, Jr. watched the show with his family as he felt it was one of the few programs on television at the time that was worthy of his children’s attention. He got what Gene Roddenberry was trying to do, just as I and millions of others did. As time went by, my fondness for Star Trek never abated. I was a thoroughly-giddy, 11-year-old kid when Star Trek: The Motion Picture was released in 1979. Similar to 2001: A Space Odyssey, I felt as though I had traveled to the future and was actually seeing it unfold before my eyes. I was enthralled by a beautiful and engrossing movie experience that film remains my favorite of the series to this day. 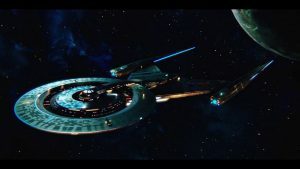 See my article Why The Motion Picture is My Favorite Star Trek Film to learn more. While some aspects changed or evolved, like the ship designs and costumes, I still felt like it was a valid and worthy continuation of the universe I had come to admire. It was so fun to see characters and situations moved forward in time in a way that allowed for a fresh take on a world that I knew like the back of my hand. In 1987, I was equally excited for Star Trek: The Next Generation. I can’t tell you how thrilling it was to have the show back on the air, and helmed by Roddenberry himself. Again, the audience was brought forward in time. In this case, nearly a century as opposed to the two and a half years (in the narrative) between The Original Series and The Motion Picture. The Enterprise-D was radically different—as were the characters, costumes, props, and visual effects. It was a take on the world that fit the time when it was produced, but more importantly, it added to the existing Star Trek timeline and served as a continuation. It also paid homage to the original and the films in a way that said they were still real and actually existed. It took itself and its past very seriously. And I loved that. While the show was a bit shaky the first couple of seasons, it was still Star Trek and I loved virtually every minute of it. The same thing happened with Deep Space Nine in 1993. In many ways, the expansion of the Star Trek universe was an important re-invention. The premise of the show turned many concepts upside-down while perhaps serving as one of the most Roddenberry-esque narratives in the property’s history. Set on a space station as opposed to a starship, it featured religion versus science as a central theme. It promoted tolerance and understanding in a way that challenged viewers and lead to solid story arcs and character development. In actuality DS9 is my favorite Trek for the reasons listed above. While I watched and enjoyed a few episodes of Star Trek: Voyager and Enterprise, both shows never felt as solid to me. They were more like product. I called them both “Star Trek Lite”. By then, I felt like the franchise was getting old, over-exposed, and (honestly) probably needed a good long rest. However, when I heard that producer J.J. Abrams had been given the reigns in 2006, I was excited. It was clear that they were going to reboot the original series for film. I thought it sounded interesting and was looking forward to seeing what he came up with. Unfortunately, I was sorely disappointed. I won’t go into my frustrations and misgivings here, a thorough analysis can be found in my article Star Trek (2009) is not Star Trek. The pain continued for me through two additional films, each one I went into with an open mind—hoping it would be an improvement. Nah. Yes, they all made money. But, as far as I’m concerned, they were not true to the Roddenberry vision and were Star Trek in name only. Honestly, with exception of the first four films, I have never felt Trek was quite right for the big screen. The show was about more than scene-chewing villains and action sequences. While it was seasoned with those elements, it was more about an exploration of humanity in an allegorical way while, at the same time, exploring the galaxy. Thus, I was briefly hopeful when I heard that a new series was being made for television. 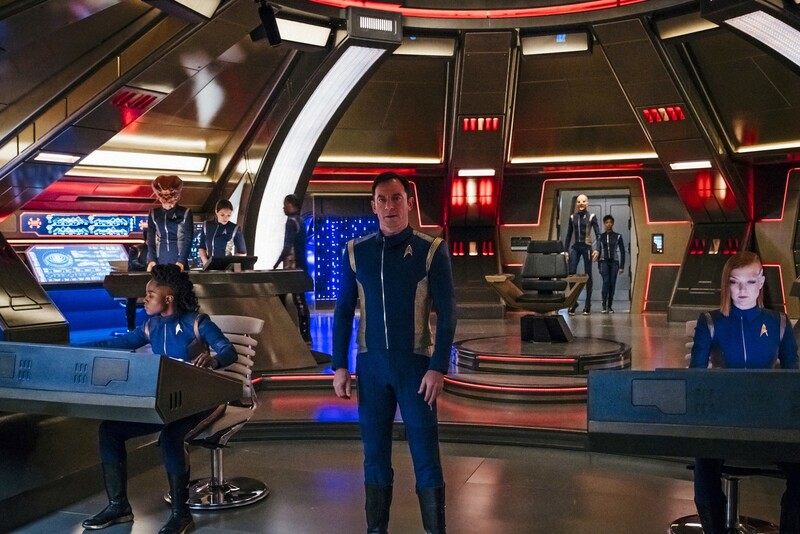 The bridge of the USS Discovery. Seriously, this has nothing to do with what ten years before Kirk looked like. However, when I read the new show was going to be lead by the same team that created the recent movies, I was again disappointed. Not because I wasn’t openminded. It was because I just don’t think this bunch gets Trek at its core. To hear that it was going to be “darker and more gritty” made me concerned. We already have plenty of dark visions of the future on TV. Excellent shows like the Ronald D. Moore reboot of Battlestar Galactica and the amazing visions of The Expanse have that aspect covered. I heard comparisons to Game of Thrones in space and The Walking Dead. Again, it bummed me out. That’s not Star Trek! I want a future that inspires. One that kids and families can watch freely, without heavy violence and gore. I want adventure and I want real SCIENCE in my science fiction. After all, Star Trek is supposed to be about exploration and the means that will get us out there. When I heard that we were getting a prequel once again, this time set “Ten Years Before Kirk”, I became even more concerned. Will they get it right, I wondered? We’ve seen what that era looks like in episodes like “The Cage” and “The Menagerie”. The pre-TOS era had already been depicted horribly wrong in the 2009 reboot. At least in that case, there was a Romulan temporal anomaly to blame for the bizarre and virtually unexplainable changes in the timeline and physics. Suffice to say, after seeing initial images of the baroque production design of the Star Trek: Discovery, I was taken aback. It was a mess. The Klingons. The ship. The costumes. It just had NOTHING to do with anything we’ve ever seen previously. Why do that to a prequel set in a time that we’ve already seen? I decided to not watch it. I kept my opinion to myself, but fellow Trek fans kept bugging me for my opinion. Why did they care what I thought? I even had several folks offer me access to their personal CBS accounts, just so I could watch it. I resisted. I had honestly seen enough in the previews to know that I wasn’t interested. It just didn’t look like it was for me. After a couple of months of pestering and arguing, I finally relented. 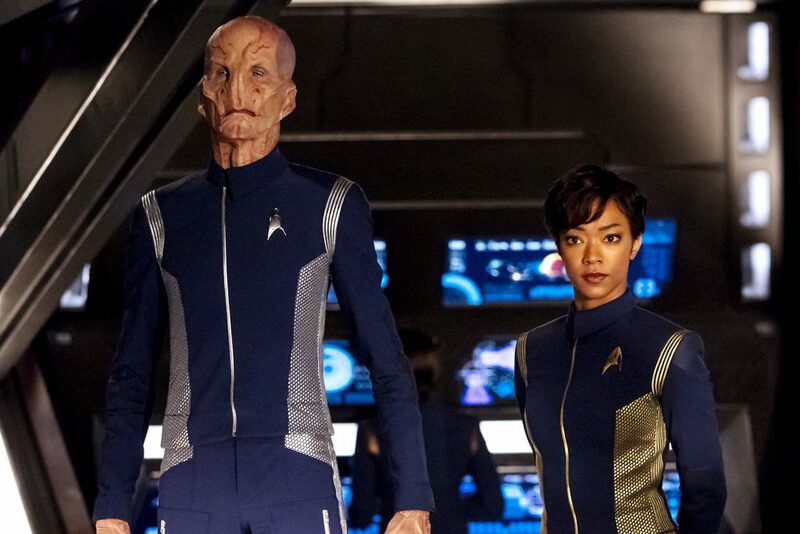 I struggled through the entire first season of Star Trek: Discovery’s fifteen episodes. After a very rough start, I forced myself to watch them all with an open mind. I saw things I liked. I saw many, many, many things that I didn’t. The bottom line for me is that I was watching an amalgam of other shows that really have nothing to do with Star Trek. The Discovery: I can’t get my head around it. The Spore Drive is ludicrous as well is everything about the Klingons. 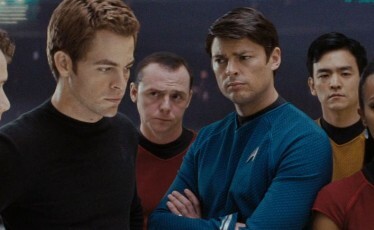 The Starfleet characters are unnecessarily mean to each other. The whole thing plays like it occurs nowadays—the music and T-shirts, the partying. It’s all very trite. The whole aesthetic is off and bizarre. The cast is okay. I actually liked the lead character (the actor playing her anyway). 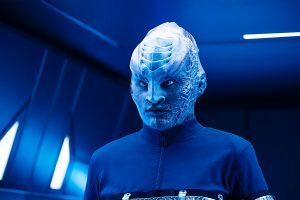 I’m also a big fan of Doug Jones’ Lt. Saru. While many of the sets are well-realized, What I still can’t get my head around are the show’s visual effects. No offense to the team creating them, but they are way too dark and color saturated. They come of as a bad Star Wars rip-off mixed with 90’s Video Toaster computer graphics. Plus, what is with the weird JJ Trek warp effect? It is nothing like the elegant star fields we have enjoyed for decades. When they were updated for TNG, at least they still made sense within the established universe. Ultimately, my point is this, why not set Discovery in the future of the timeline (post-Nemesis)? Then, the producers could have done virtually anything they wanted and played it off as new discoveries or advancements. New species, even bizarrely-evolved Klingons. I can’t see the point in making it a prequel. I don’t understand the dismissal of Star Trek canon. I’m disappointed in the disrespect to the design and writing of the past. I don’t plan on watching further. I’ve had enough. But, I hope others who like it continue to enjoy it. You can’t say I didn’t give it a true shot! I think for me, the bottom line is that I honestly don’t think anyone has really given creating a TRUE prequel a shot. People make fun of the original series for its production values, saying the sets and costumes were cheap. It was quite the contrary. All one has to do is imagine what it must have been like for audiences to watch TOS back in 1966. If the vision hadn’t been sound and memorable, we wouldn’t even be here discussing it! 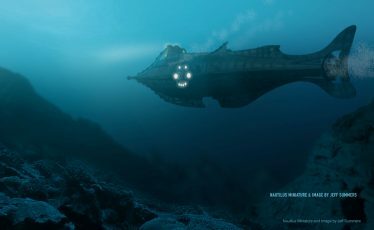 Plus, I believe there is a way to take the original designs and update them with today’s production design and visual effects techniques. The fact is, no one from the current regime is willing to give it a shot. I’ve seen fan creations—namely versions of spacecraft—over the past decade that surpass the vision and quality of what we’ve seen since 2009. I will await new properties that show positive, optimistic visions of the future. I will keep watching The Orville—because for me, regardless of its humor, it has the true DNA of Star Trek. It is the current descendent of Gene’s vision of hope. Sad, but true. Thanks for being open to hearing some thoughts! Learn about FutureDude’s new film, Persephone, see its amazing pre-production visuals, and find other exclusive content right here.